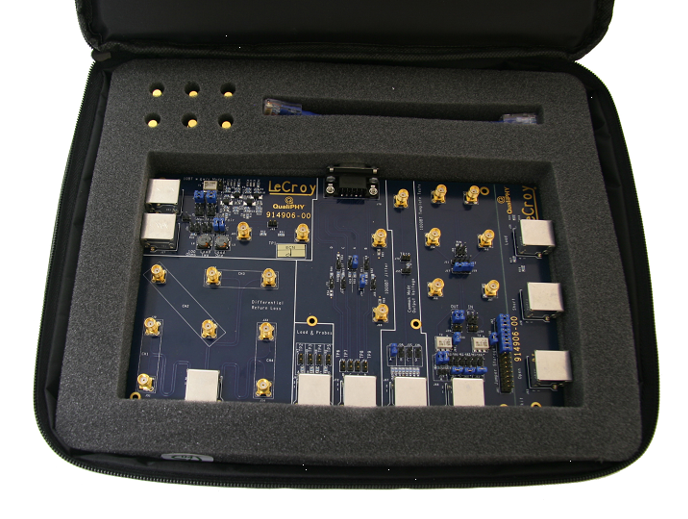 The 100Base-T1 tests call for an oscilloscope with a bandwidth of at least 1 GHz and sample rate of no less than 2 GS/s. These requirements are called out in the test suite document. We recommend a sample rate of at least 10 GS/s to ensure sufficient oversampling for jitter measurements. Additionally, it's highly recommended to use either an oscilloscope with spectrum-analysis capability or a stand-alone spectrum analyzer for the power spectral density test. Another required piece of equipment is a waveform generator for the disturbing sine wave. This can be any arbitrary waveform generator capable of producing a 5.4 V pk-pk signal at 11.11 MHz. Along with the AWG, you'll need two BNC cables and two BNC-SMA adaptors. 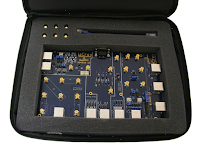 An essential element is the Ethernet test fixture (one example being Teledyne LeCroy's TF-ENET-B), which may be used for 10/100/1000Base-T testing in addition to Automotive Ethernet compliance testing. The TF-ENET-B has the requisite RJ45 interface, the breakout section that's used for all of the compliance tests but the distortion test, as well as a distortion-test section to cover that need (Figure 1). The distortion-test section ensures that only the DUT sees the disturbing sine-wave signal. When using the fixture, be sure to pay attention to which pair the signal is brought out on the RJ45 connector. When it comes to connecting the DUT to the Ethernet test fixture, the Medium-Dependent Interface (MDI) is not mechanically defined in the specification. The wording of the test suite document says only that the tester is responsible for creating a mating fixture/cable. This is referred in the document as the "short automotive cable." It should be as short as possible to minimize signal losses. Figure 2 shows an example of such a "short automotive cable." The twisted pair is soldered to Pair A of the RJ45 connector, so it's pre-determined that when the cable is plugged into the Ethernet fixture, the signal is coming out on Pair A. Let's wind things up with a few words about automated compliance software. It hasn't been mentioned until now because, of course, Automotive Ethernet compliance testing can be performed perfectly well without it. However, using the automation software will greatly reduce the testing time: running the complete test suite takes less than 10 minutes. The software generates complete documentation of the test results. It guides you through each step of the process, eliminating the need to be an "expert." Lastly, the results you get are fully repeatable because the testing is performed in exactly the same way every time you run it. Advanced debugging features make automated software even more useful. A stop-on-test capability enables you to pause the testing sequence after each test and seamlessly resume testing after debugging the DUT. A pause-on-failure feature alerts you to the failure of any test. Lastly, any test can be looped for easy performance of optimization testing or margin testing. Looking to the future of Automotive Ethernet compliance testing with 1000Base-T1, oscilloscopes with higher bandwidths of at least 2 to 2.5 GHz are a must. The test fixture and cabling remain the same.